← Milford’s Interpretation Board – Cleaned at Last! Swifts – for anyone over the age of 30 – were the traditional background noise to summer evenings in towns and cities with their exuberant screeching calls and circling flights going higher and higher into the evening sky. You may have noticed that the numbers of swifts around Milford, in common with the rest of the country, are decreasing every year. This is due to lack of suitable nesting sites for them (and housemartins) as we all do up our houses and tidy up abandoned buildings; and this is throughout the country. If you want to help bring these iconic summer visitors back to Milford, Blooming Milford are offering free swift pockets (from the RSPCA) to residents who wish to put them up on their eaves. Call or text David Moreton on 07778 004374. The extremes of weather this year have had one very positive effect: bumper fruit crops. 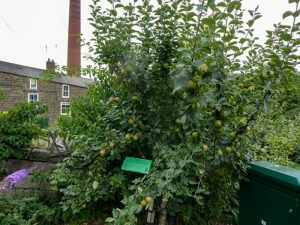 The ‘Beast from the East’, delaying fruit flowering till after the frosts, and the very hot summer have produced laden fruit trees throughout the country, and the Milford Triangle between Chevin Road and The A6 is no exception. The apple and pear trees on Triangle were planted for everyone to use so please feel free to take them for yourselves. The apple on the sharpest point of The Triangle is a Bramley, the ideal cooking apple, whereas the one at the other end of The Triangle is an eater, James Grieve. The pears are Conference and are concentrated on the A6 side of trees – obviously get at them from the other side for safety. Suggested recipes are available in the Blooming Milford section of the website. It’s been a busy year for us. We’ve completely replenished the herb planters on the Triangle and on the riverside development – again, all residents are free to use. We’ve planted a swathe of Tete-a-Tete daffodils on the A6 side of the play area, which were lovely in the spring, and we plan to plant more this autumn. We’ve hacked out some of the overgrown bushes on The Triangle and replaced them with flowering shrubs such as potentilla, Christmas box and hypericum, and many heathers. Our major project for this year is the installation of 4 benches along the riverside meadow in the Hopping Mill Meadow development. It’s taken 2 years of jumping through numerous bureaucratic hoops to get here – the final hoop is approval of Belper Town Council which we hope will come at the council meeting on 11th September. This entry was posted in Derbyshire and tagged bloom, East Midlands in Bloom, flowers, Fruit trees, Milford, Swifts. Bookmark the permalink.